Episode 3: "The Lost Face"
Working as a special investigator for the Grand Jury, Charlie Chan seeks information from Lt. Stutz of the Valley Division of the LAPD on Daniel Randolph, a notorious criminal lawyer who has purported mob connections. Newspaper reporter Zac West, who is on a crusade of his own against Randolph, is called to Stutz' office to help out. While there, a telephone call informs Stutz that West's wife has been attacked by an assailant at their home, blinded by acid thrown in her face. Chan and West go to a nearby cafe run by Willie Brower who, hearing the bad news, tries to comfort Zac. Soon, Lt. Stutz arrives, informing Chan and West that the attacker, identified as Jack Hart, has been picked-up. At police headquarters, attorney Randolph arrives to represent Hart. Chan notes to Hart that three of Randolph's previous clients, Antonelli, Jarvis, and Bennett, were killed mysteriously soon after having been freed by Randolph. 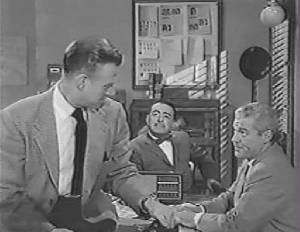 Later, Chan suggests to Stutz that someone inside the police department may be informing Randolph whenever one of his clients has been arrested. Paying a visit to Randolph’s home, Chan discovers that the lawyer has been shot to death. Zac West, the prime suspect, is taken into custody by Lt. Stutz at Willie Brower’s cafe. Following West's arrest, Willie hands Chan an envelope containing a large sum of money to pay Chan to prove West's innocence. Chan aggress, but states that he will do so only if Willie can accept his findings "even if the guilty one is someone you don’t want found out." Back at Stutz' office, the Lieutenant admits that he, too, had once tried to kill Randolph who had, he felt, been responsible for his younger brother’s death year earlier. His attempt had failed due to a defective bullet that had misfired. At this, Chan notes that Stutz could be under suspicion as much as West, so Stutz has Zac released. That night, Chan drops into Willie Broward's cafe for a cup of coffee. Soon, Jack Hart also arrives for a meeting arranged by Chan. Chan, suggesting it was Hart who killed Randolph, also notes that there was another "hatchet man" working for Randolph who had been called on to kill Antonelli, Jarvis, and Bennett. Revealing that it was Willie Jarvis who killed the three men and kept Randolph informed as to which clients had been arrested by the police, Chan moves quickly to disarm Hart and overcome Brower. As the police take the two men away, Chan tells Willie that the money he had received from him will be used to help attempt restore Mrs. West's vision. Lt. Stutz (to Zac West): "Mr. Chan's on a spcial investigation for the Grand Jury." When a shepherd discovers three of his flock slaughtered, he usually looks for the wolf. Not even the sound of a thousand children's voices can replace the sight of one smudge of dirt on a little rosy cheek. Patience is a man's best friend. Even the strongest tree needs support in a violent storm. A boulder of suspicion cannot stop an avalanche of justice. When a tree is weighted down with the snows of adversity, who is there to say when the limb would break? Ten years to an innocent man is like ten lifetimes. The judge never wields the executioner's ax.